The formation of the EU and Economic and Monetary Union (EMU) was predicated on an increased convergence among member countries not only on economic but also on political grounds, in terms,for instance, of quality of institutions and respect of the rule of law. While it was obvious that the euro area did not satisfy the criteria for an optimal currency area at the time of introduction of the common currency, the expectation was that this problem would have been gradually solved. Increased economic convergence would have also made it easier to introduce institutional reforms to further strengthen the euro area and to make it possible to converge into a fully-fledged political union. The euro was to become the common currency of the EU. All EU countries, indeed, with the exception of Denmark and the UK, had committed to eventually adopting the euro. Observing the situation almost 20 years after the first decision concerning the adoption of the euro (1999) and almost 15 years after the decision concerning the Eastern enlargement (2004), it is tempting to conclude that European policymakers could have not been more wrong. Economic convergence, as measured for example in terms of GDP per capita, reverted to strong divergence in the euro area after the outbreak of the economic crisis. Economic convergence, instead, has increased strongly between Western and non-euro area Eastern European countries, but political models have diverged so much that for the first time in EU history a member country (Poland) is currently under judgement for violation of the rule of law. This conclusion might be too hasty, though. The international economic crisis in 2008-09 and the subsequent euro crisis in 2011-13 represented an important breaking point in the evolution of the euro area. As a consequence, several countries in the ‘periphery’ had to undertake severe fiscal adjustments and structural reforms, in some cases in exchange for the financial support granted by the newly introduced European Stability Mechanism (ESM). The crisis revealed the existence of many pitfalls in the architecture of the EMU, which has also been reformed by making the first steps towards the introduction of a Banking and Capital Union and by strengthening fiscal and economic surveillance on member countries. In light of these developments, one could hope that the observed reduced convergence in terms of per capita GDP in the aftermath of the crisis might just be a temporary episode in an overall process of economic and institutional convergence. To investigate these issues more in detail, it is not enough to look at currenteconomic performance. We need to consider the evolution of factors that might affect futureeconomic growth, such as the provision of services that determine the accumulation of human capital (health and education), the competitiveness of markets (civil justice, labour and product market regulations) and the quality of political and social institutions. If, despite the economic crisis, convergence continued across EMU countries with respect to these fundamental factors, economic convergence might also be expected to resume in the future. 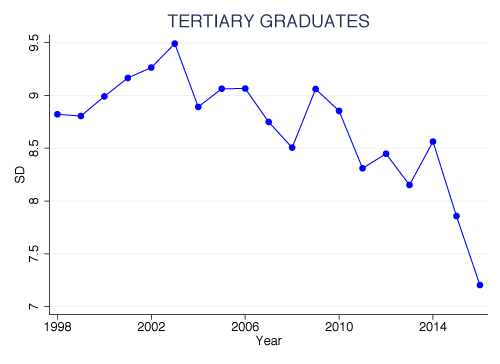 To this end, in a recent paper we collect a vast array of comparable data from several sources concerning public services, product and labour markets regulation and quality of institutions in a sample of OECD countries over the period 1990-2016 (Bordignon et al. 2018). To guarantee higher homogeneity in terms of political and economic institutions, we include in our sample only the countries which joined the OECD before 1989 (with the exception of Turkey). This implies that our analysis focuses only on the early entrants in the EMU, namely, the 11 countries that joined the EMU in 1999 and Greece (whose entrance occurred in 2001).1 Considering a larger set of developed countries (rather than just those in the euro area) also allows us to test whether, during the international crisis, the countries that adopted the common currency implemented different policies with respect to the countries that were not part of the euro area. Our analysis reports both good and bad news. We use standard measures of convergence (i.e. 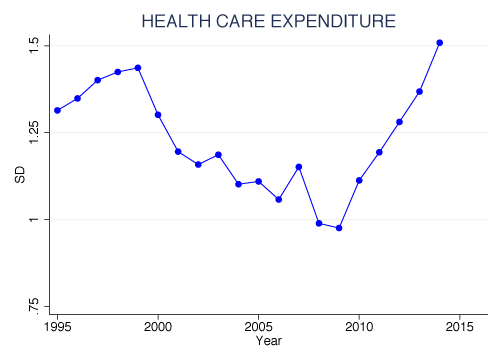 sigmaand betaconvergence)2 and document that even if after the beginning of the crisis EMU countries diverged in terms of expenditure on public services concerning human capital accumulation, the process of convergence in several output indicators did not halt (Christl et al. 2018). 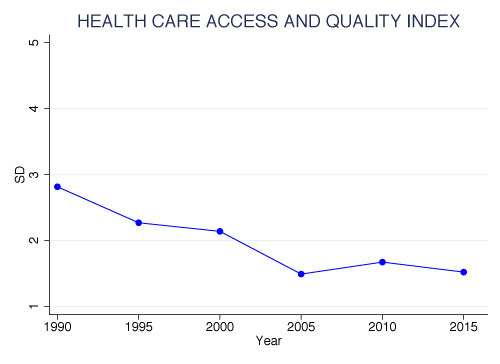 For instance, as Figure 13 shows, EMU countries converged in terms of quality of health care, as measured by the Healthcare Access and Quality indicator, or share of tertiary graduates in the population. As it concerns civil justice, competitiveness, efficiency, regulation of both labour and product markets and female participation in the labour market, we actually find strongevidence of convergenceafter the crisis. 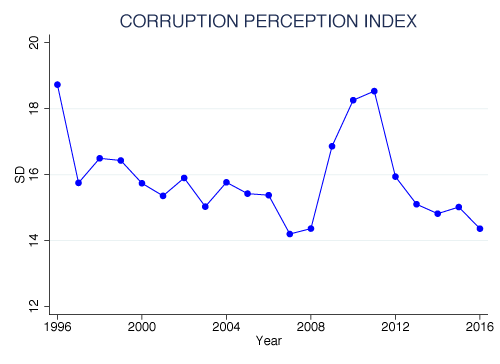 In line with the results of earlier studies regarding the pre-crisis period (e.g. Alesina et al. 2008, Nicoletti et al. 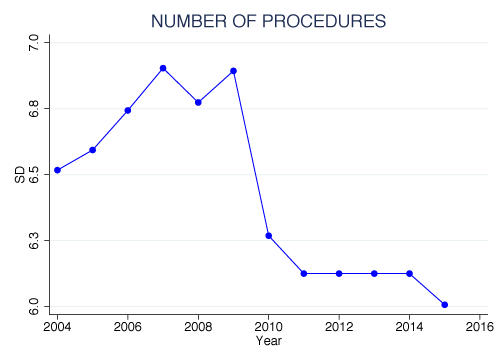 2003, ECB 2015), we find that after the crisis in backward countries there was a larger increase in female participation, markets were more deregulated, the number of procedures for civil trials fell more, and the general index of doing business improved more (see Figure 2). Following Reinhart (2002), our econometric analysis exploits the credit rating downgrade operated by international agencies (e.g. S&P Global Ratings 2018) as a proxy for the timing and severity of the economic crisis in the period between 1990 and 2016. The use of downgrades to measure the economic situation of a country is also supported by the conclusions of recent analyses on the economic determinants of sovereign rate movements in the euro area (e.g. Brůha et al. 2017). The analysis further underpins the results reported above. 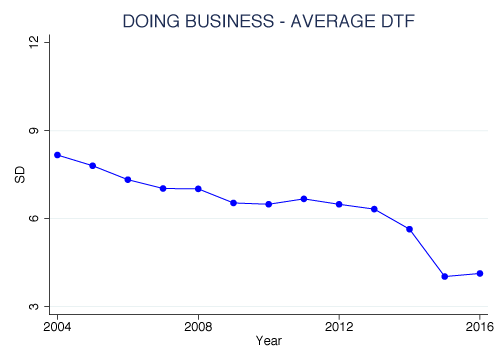 For example, our estimates suggest that EMU countries hit by the crisis were more successful than other OECD countries hit by a similar crisis at implementing reforms that improved the efficiency and competitiveness of their economies, in particular as far as labour and product market regulation and civil justice indicators are concerned. 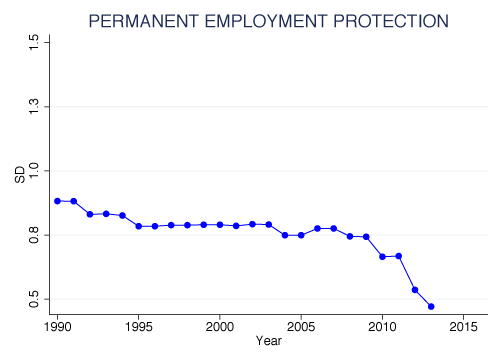 Moreover, this was not just the consequence of ESM programmes, which seem to matter only for the adoption of policies aiming at the deregulation of the labour market. The good news ends here, however. 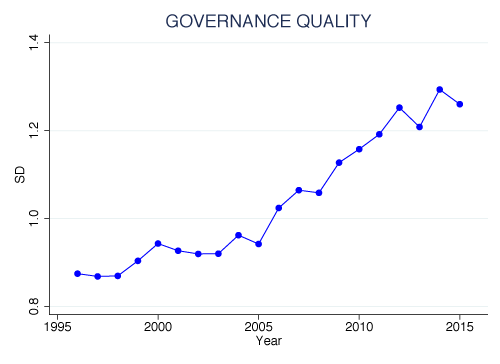 In spite of the above convergence, euro area countries strongly diverged in terms of citizens’ perceptions about quality of governance and corruption, trust in national institutions, as well as in the turnout at national elections (Dustmann et al. 2017). There is also evidence that income inequality and poverty levels, which were converging towards lower values in EMU countries before the crisis, diverged after 2008. 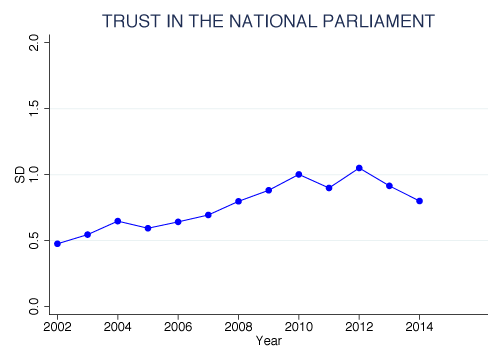 Interestingly, the economic crisis accelerated a diverging tendency in citizens’ perceptions about trust and quality of government that was present even before 2008 (e.g. Alesina et al. 2017) in a number of periphery EMU countries such as Greece, Italy, Portugal, and Spain (see Figure 3). The evidence provided in our work is purely descriptive; however, the main message is pretty clear. The viability of the EMU project seems to be more in trouble on political rather than economic grounds. A renewed process of economic growth in the periphery may ease political tensions, but it is worrying that divergence in trust and quality of government already preceded the economic crisis and intensified with it. In spite of the achievements of economic reforms, lack of trust in institutions and the perception of low quality of governance in several Southern euro area countries could easily lead to a political backlash, reversing the reform process. If we also consider the decreasing trust in European institutions and the rising consensus for populist parties that we detect even in the euro area countries that avoided the crisis, the continuance of the EMU project seems to be facing a serious challenge. Alesina, A., Ardagna, S. and Galasso, V. (2008), The Euro and Structural Reforms, NBER Working Paper No. 14479. Alesina, A., Tabellini, G. and Trebbi, F. (2017), "Is Europe an optimal political area? ", NBER Working Paper No. 23325. Barro, R. J. and Sala-i-Martin, X. (1992), "Convergence", The Journal of Political Economy 100(2). Bordignon, M., Gatti, N. and Onorato, M. G. (2018), "Getting closer of falling apart? Euro countries after the crisis", CESifo, Venice Summer Institute 2018. Brůha, J., Karber, M., Pierluigi, B. and Setzer, R. (2017), "Understanding sovereign rating movements in euro area countries", European Central Bank, Working Paper Series No. 2011. Christl, M., Köppl-Turyna, M. and Kucsera, D. (2018), "Public sector efficiency in Europe: Long-run trends, recent developments and determinants", Agenda Austria Working Paper No. 14. Dvoroková, K. (2014), "Sigma Versus Beta-convergence in EU28 in financial crisis and postcrisis period", WSEAS Transactions on Business and Economics No. 11. Dustmann, C., Eichengreen, B., Otten, S., Sapir, A., Tabellini, G. and Zoega, G. (2017), Europe's Trust Deficit: Causes and Remedies, A VoxEU.org eBook. European Central Bank (2015), "Real Convergence in the Euro area: evidence, theory and policy implications", Economic Bulletin. Gros, D. (2018), "Convergence in the European Union: Inside and outside the euro", CEPS, Informal Meeting of Economic and Financial Affairs Ministers, Sofia, 27-28 April 2018. Guiso, L., Herrera, H., Morelli, M. and Sonno, T. (2017), "Populism: Demand and Supply", CEPR Discussion Paper No. 11871. Heinen, N. and Kreutzmann, A. (2015), "A profile of Europe’s populist parties. Structures, strengths, potential", Deutsch Bank Research. Reinhart, C. M. (2002), "Default, currency crises and sovereign credit ratings", World Bank Economic Review 16(2). S&P Global Ratings (2018), General Description of the Credit Rating Process, as of March 21, 2018. In contrast, Gros (2018), who presents similar results to ours but on a smaller and different set of economic indicators, also considers later entrants, concluding that euro membership had very little to do with the observed patterns of convergence and divergence across European countries. We also collected data for late EMU entrants, but the heterogeneity with respect to the original entrants under several dimensions was too large to allow for a meaningful analysis. See Barroand Sala-i-Martin (1992) for an introduction to the notion, andDvoroková (2014) for an earlier application to EU countries after the crisis, only considering per capita GDP evolution. [3 ]Figures 1 to 3 show the value of dispersion, measured by standard deviation, among EMU countries; hence, a decreasing level of dispersion implies convergence and vice versa. For a more detailed analysis of the determinants of the supply and demand of populism, see also Guiso et al. (2017). A crucial point of their analysis is that a general feeling of anxiety and uncertainty about the future might be a more prominent factor for the demand of populism than just an economic downturn.